Cashmio Casino will then reward you with a bonus (Welcome Bonus is for new players only). The terms and conditions of the bonuses vary between different casinos and might also change over time and between different countries, so it is important to compare the different offers and read the T&C for Cashmio Casino before signing up. 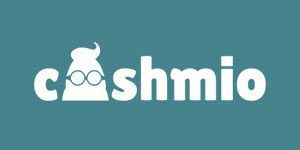 Cashmio casino was launched in 2015 by MT Secure Trade Limited Casinos, an experienced and a renowned operator that owns and manages over a dozen more gambling sites with some of the highest rankings in the industry. As a browser play casino, Cashmio Casino does not require any downloads and users can easily launch it on their mobile devices since the site is optimised for smartphone and tablet users. 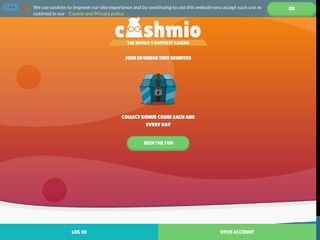 In terms of visual features and design, Cashmio Casino takes a whimsical approach, featuring minions as the casino mascots – the bubbly atmosphere does not, however, interfere with the functionality of the site and the visitors will find it easy to “communicate” with the platform and locate the needed information – the home page even includes the information on the accepted banking methods which you can see right under the registration form whereas most casinos provide the list of payment methods at the bottom of the page only. Apart from an attractive and colourful design, the new members will also be able to look forward to the casinos Welcome package that includes both a deposit and a No-deposit offer, excellent gaming selection provided by some of the best developers in the industry and a secure, reputable gaming environment regulated by MGA and UK Gambling Commission. Cashmio Casino partners with the highest ranking software providers in the gambling industry, including NetEnt, Play’N GO, Microgaming, NextGen, Barcrest, Quickspin, Elk… Since the casino is focused on slots, the categories used for the gaming offer classification are pretty general and the player can browse through New Games, Jackpot Games, and Live Casino. However, the game filter at the top of the page will allow the user to really narrow down the search and sort the games according to the provider, themes (Furry Games, Movies&TV, Scary Games, Classic Games, Sporty Games. 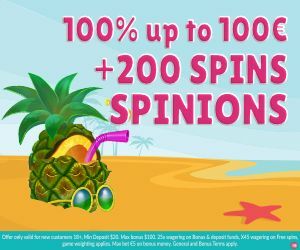 Mythical Games, and Yummy Games) and last, but not least, special features (win-ways, Wilds, Bonuses, Free Spins and Tumbling Reels). The great thing about the filters is that they can be combined, which really pinpoints the game and enables the players to list only the releases that match all of their criteria. Apart from a great filter and the search engine, Cashmio casino enables the site visitors who are yet to create their accounts to launch the game in free play mode and get all the necessary information before they even start playing; the betting limits and the number of paylines are displayed on the preview picture and if you click on the “i” to the right, a brief description of the game will pop up. For those who are in the mode for some fresh action, the “New” category is where all the latest releases can be found. For the sake of keeping the true gambling spirit alive, Cashmio has also provided a game finder available under the advanced filters – to see what fortune has in store for you, just click on the “Find me a game” tab and a random slot will pop up. It there is anything missing from the Cashmio advanced filter, it’s the engine’s limitation to slots only. Table and casino games cannot be found in the same way and if you would like a spin on the Roulette Wheel, or a few hands of Blackjack, you will need to use the search bar. The video versions of Poker and Baccarat are available as well. There is no separate category that would include Keno, Scratchcards, and Bingo, although some of these games are included in the offer and can be located using the search bar. Live Casino platform in Cashmio is powered by NetEnt and Evolution. The games are available to the registered members only and apart from the Roulette, Blackjack, and Baccarat tables, Dragon Tiger, Dream Catcher Wheel, Caribbean Stud, Speed and Lightning Roulette are streamed as well. The depositing at Cashmio is fee-free and the methods available are Visa, MasterCard, Paysafecard, Euteller, Neteller, InstaDebit, Skrill Sofort, EcoPayz, Entercash, and P24. The processing time is instant and the money will be transferred to your cashier in next to no time. For withdrawals, the members can use Bank Transfer, Visa, Trustly, Neteller, Skrill, and EcoPayz. The settlements will take place within 24 hours for e-wallet users (up to 5 days for Bank Transfers and up to 3 days for card withdrawals) and the casino will only take one day to process the withdrawal request. The amounts of $50,000 and up (with the exception of progressive jackpot wins) will be paid in instalments. Any confusion is likely to be clarified with no more than a single visit to the FAQ section, however, if you feel the need to talk to someone, or if your problem is not listed, Cashmio provides Live Chat and email support. The agents are available from 9.00 to 01.00 CET time.